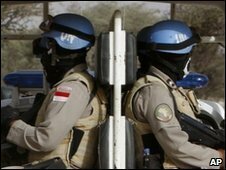 Four South African peacekeepers who were kidnapped in Sudan's troubled Darfur region earlier this month have been released, the UN says. The two men and two women - who are part of the joint UN-African Union force, Unamid - were abducted after leaving their base in Nyala. Rebel Movement for the Popular Struggle spokesman Ibrahim al-Dukki said no ransom had been paid. He said the abduction was to show Darfur was not safe for elections. A civil war has pushed about three million people into refugee camps in Darfur and the region is prone to lawlessness and banditry. A number of expatriates, including aid workers and Unamid officials, have been kidnapped by armed groups demanding ransom.